Churches can easily manage all their bookings contacts using the Customers area in the Bookings module. 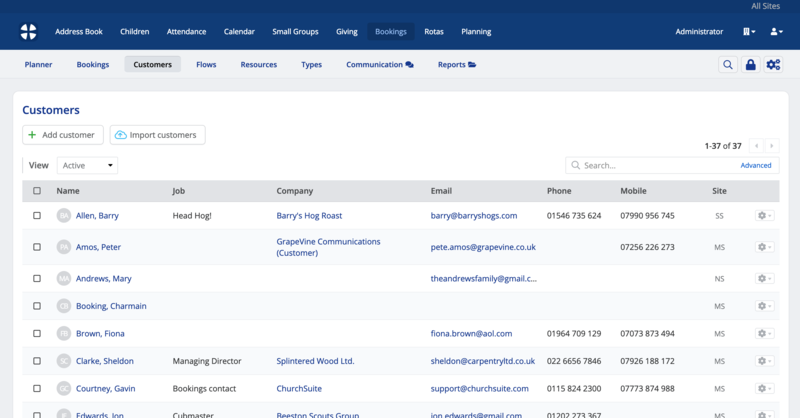 When assigning a contact to a booking, the contact search will match against both your Address Book contacts and those organisations and individuals on your customers list; ideal for churches that have internal and external resource users. Adding or importing Customers in the Bookings module works in exactly the same way as adding or importing contacts in the Address Book. To add a new customer click Add customer. Complete the various fields of contact information - First Name and Last Name are required fields. Save the changes when you are finished and before navigating away from the page. You can also add a new customer when adding a booking. 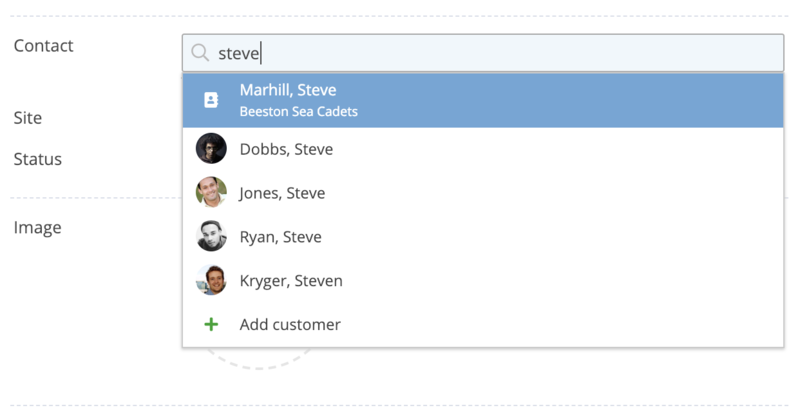 Using the booking Contact search, begin to type your customer name (contact name or company name), to make sure they're not already on the system. If no existing customer or contact is matched, the Add customer option at the bottom of the list can be used. Churches can easily import customers; perhaps if migrating from a previous bookings management system - you will need to export a customer list from that system and then prepare the list into a CSV format file ready for import. When you are ready to import, navigate to the Customers page, click Import customers. The Import customers page (see next screenshot) includes helpful guidance on how to prepare and present your data - a CSV format file with each field of information in its own column, and a column heading in the first row that describes the field. The column heading is used by ChurchSuite to correctly map each field in your CSV file with the corresponding field in the Customers table in the Bookings module. 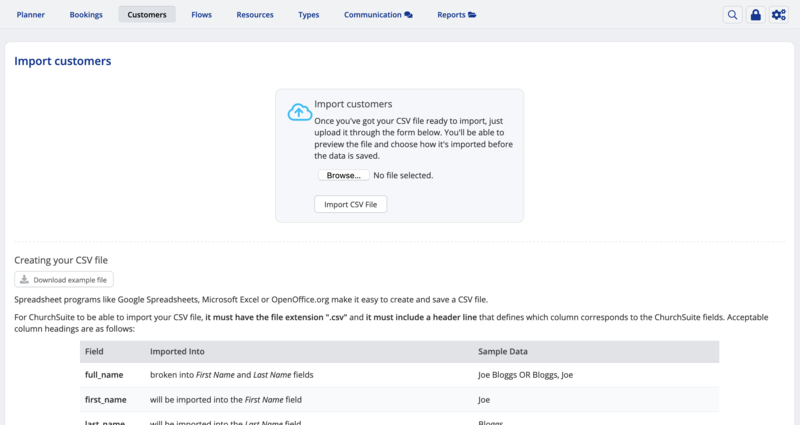 The Import customers page also includes an example CSV file that you can download and view, and a full specification list of fields that can be imported is provided. Not every field is required - you don't have to have a column in your CSV file for every field - ChurchSuite will only import those fields which you supply in your CSV file; however you must ensure every incoming field that you supply in your data is assigned to a ChurchSuite field (otherwise it won't be imported) and in an appropriate and consistent format. Follow the on-screen instructions - select Choose file and navigate to your CSV file. Click Import CSV File to upload the file for review. After upload, the first five records of your uploaded CSV file are displayed (see next screenshot). The first column shown is the CSV Header names from your CSV file. The Import As column shows you which field your data is going to be mapped to in ChurchSuite when the import is completed. At this stage you can manually change any of the field mappings that are incorrect. Warnings, designated by a yellow warning triangle, indicate a field in your CSV file that ChurchSuite doesn't know what to map to - simply select the correct field from the drop-down Import As list, or leave it marked as Do not import if that field is not required. When you are satisfied all of your CSV fields are correctly mapped, click Import All Records at the bottom of the page (or Cancel or Cancel import if you need to make changes to your CSV file and restart the import process later). Once imported, an Import summary is displayed confirming the records that were successfully imported. An Import errors report summarises any issues encountered during the import, including the Row number within your CSV file, the customer Name, the Field that contains the error, a brief description of the Error detected and the Data in the field that is in error. If any errors are detected the report will continue to be displayed until the Clear errors button (at the top right) is clicked and confirmation that the errors are to be deleted. 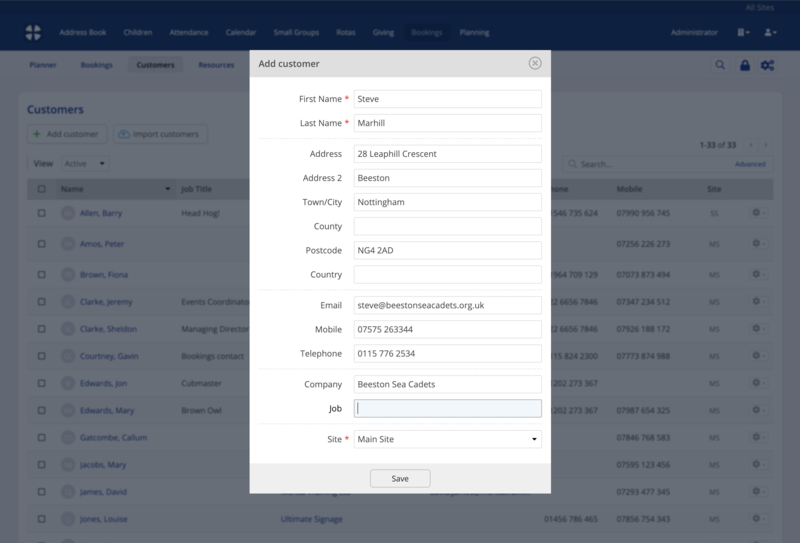 Once you have added or imported customers, the Customers list provides a number of helpful features on the actions cog on the right-hand side of the page, making it easy to perform common tasks like Duplicate, Edit, Archive and Delete. Note that the customer list below is showing Active customers. You can easily switch to view Archived customers. You can also use the Search box and Advanced search feature to filter the customer list if you wish. Archiving a customer does not affect existing bookings against which that customer may have already been assigned; however an archived customer cannot be assigned to new bookings. An archived customer can be Set as active again. Customers are automatically grouped together by Company, so when viewing a customer's profile page, you'll see other customers At this company, including any archived customer contacts shown in strikethrough font. You can delete a customer either by clicking the Delete button in the top right corner of the customer's profile page - see screenshot above, or you can select Delete from the cog actions menu on the Customers list. Deleting a customer will remove them from all past and future bookings and is not reversible. The bookings themselves will not be deleted. ...you can also view Past and Future bookings or filter customer bookings by Status, perhaps to view just Confirmed bookings or Pending bookings that have not yet been confirmed. Click on a booking Name to click through and see the resources booked, or click on the Booking refernce (under the booking name) to view a filtered list of bookings for that reference. Continuing down the customer page is the Charges table - switch between viewing Any, Unpaid or Paid charges for the customer. 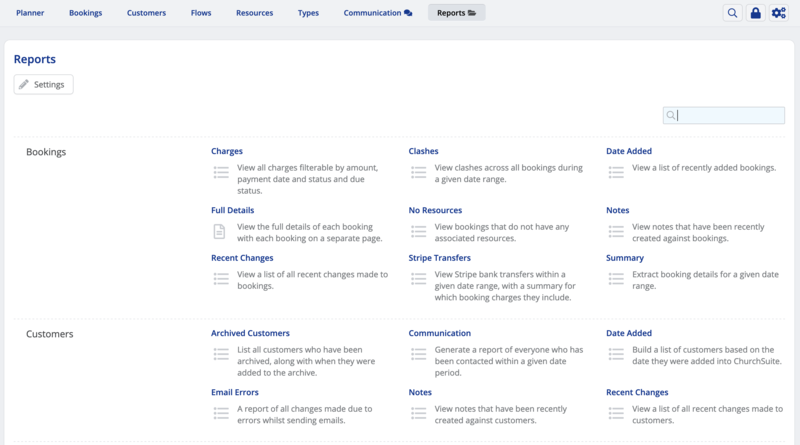 From the cog actions menu on the right-hand side in the list, you can click through to view the Changes log in respect of a particular charge - perhaps to see which users have made changes and when - or to Edit a charge - perhaps to record a payment, or to Delete the charge. Each customer profile includes a Communication and recent Changes log at the bottom of the page. The Communication tab lists historic sent communications to the customer, and the Changes tab lists changes made to the customer's profile. Note that bookings, charges and customer notes are not considered as changes to a customer's profile. 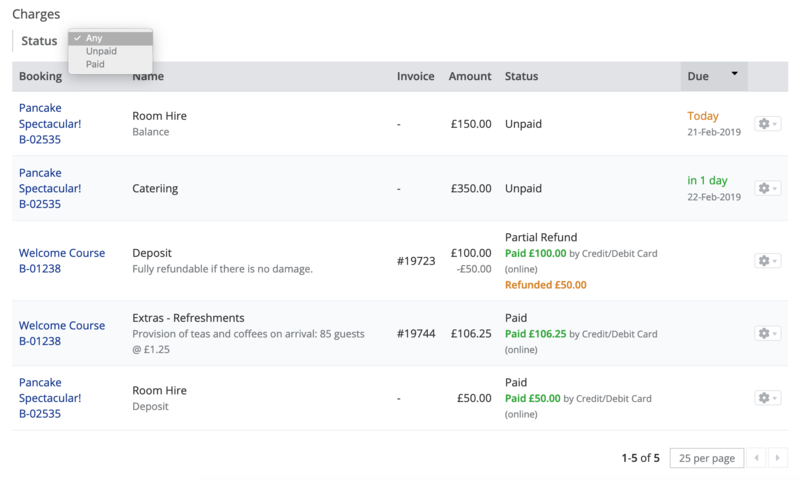 Users can add Notes against customers, perhaps to record information such as agreed terms, discounts, special needs etc. As with notes elsewhere in ChurchSuite, you can restrict the visibility of notes and pin/unpin notes within the list. 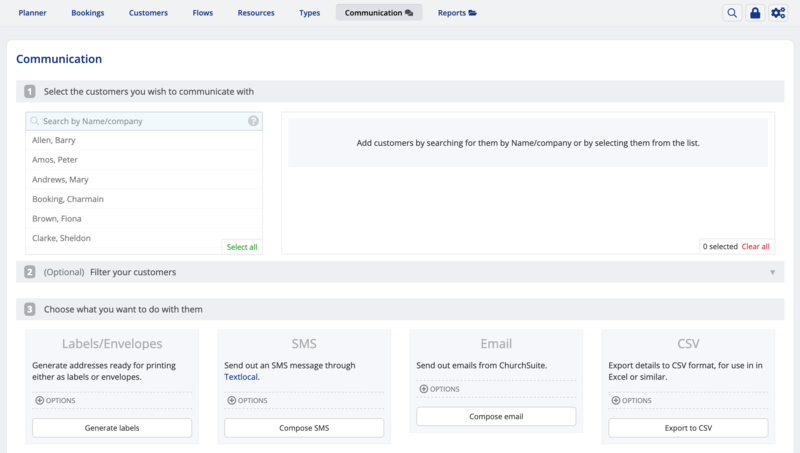 You can communicate with a customer directly from the Customer profile page using the Communicate drop-down button at the top of the page (see above screenshot). The message 'compose' window has the usual options to select preset emails and SMS messages, merge field personalisation, branded templates and message scheduling. All 'sent' communications are added to the Communication log at the bottom of the customer profile page in the Recent Activity section, and can also be viewed in the Booking module > Reports > Communication report. The Bookings module also includes a Communication menu with functionality just like other ChurchSuite modules, enabling users to easily communicate with active (not archived) customers. ...or type all: to select all active customers for all companies. Once you have selected which customers you wish to communicate with, you can further Filter and finally select how to communicate e.g. Email, SMS, CSV export etc. There are a number of helpful customer-related reports provided in the Bookings module's reports section - ideal for filtering and reporting against all your customers, perhaps to view past communications or customer notes.